Frederik Magle's Tradition in Modernity: the Classic Art of Organ Improvisation on "Like A Flame"
Improvisation of course did not originate with the coming of jazz. In the realm of classical organ music, for example, there is a tradition of improvisation that has Johann Sebastian Bach as its most illustrious practitioner. In more recent times the school that includes Franck, Vierne, Widor, Tournemire, Dupre and the Alains made good use of the sonic possibilities of the modern cathedral organ and conceived of the results symphonically. 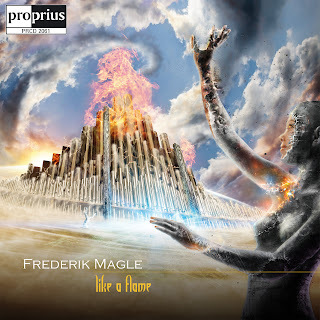 The young Frederik Magle has absorbed the tradition and in the persuasively rich 2-CD recital Like A Flame (Proprius 2061) gives us back his modern version of it. I will deflate any rhetorical suspense I might build up and say here that the results are something any aficionado of organ music will find delightful. His improvisations are varied, inventive and sonically powerful. The recording has excellent sound qualities as well. It makes me want to hear his compositional work. Highly recommended! Mid-western USA may not always get the national press coverage it deserves for its cultural institutions, but it remains a vital hotbed in every sense of the term. Zeitgeist, for example, a new music quartet consisting of two percussionists (Heather Barringer and Patti Cudd), woodwinds (Pat O'Keefe) and piano (Shannon Wettstein), celebrates 30 years of continuous concertizing this year, yet here in the New York area they are not that well known. The celebration is being marked by an adventuresome two-CD set Zeitgeist: Here and Now (Innova 799) that will enable all of us who might have missed them the chance to appreciate the breadth, scope and excellence of their music-making. The set includes 30 short compositions that exemplify the full range of concert music styles in the recent present, from the improvisational (Douglas Ewart) to the so-called postmodern (Philip Blackburn) and much in between. It's an exhilarating, whirlwind trip through some very lively music, played with sensitivity and fire. I would think it a very good introduction to modern 21st century chamber music for those who want to understand what is going on right now. For anybody else it is a very rewarding listen, too. Take a look at the details on this one by clicking the Innova link on this page. An interesting, rather essential anthology! 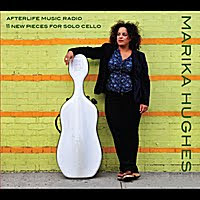 Marika Hughes has put together a program of 11 new and newer pieces for unaccompanied cello, Afterlife Music Radio (DD001). It sounds on occasion as if there may be just a little overdubbing going on, but otherwise, there is Marika, her cello, a few microphones and your ears involved. Marika tends to play with a modernist vibratoless attack, but she is quite expressive on a dynamic and timbre-variational level. Of the composers, I recognize one from the jazz world (Nasheet Watts). Beyond that the names are not familiar to me. This of course does not mean anything in itself, except perhaps the new music is provided in part by new or new-ish composers. What counts though of course is the music and its performance. Marika comes off well and the program has a sometimes bittersweet stoicism that suites the new millennium in many ways. Listen and revel in the rich tone of Ms. Hughes' cello. 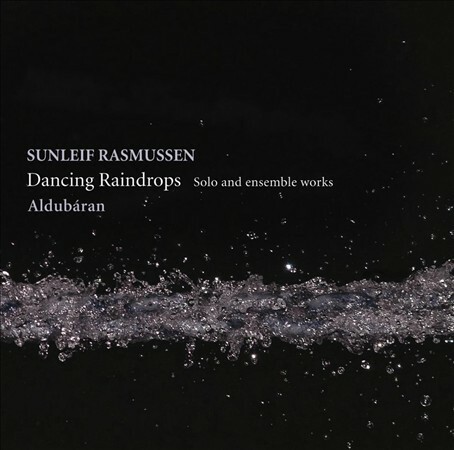 New Chamber Works From Sunleif Rasmussen: "Dancing Raindrops"
Rigorously conceived modernism joins hands with visionary poetics in the chamber music of Sunleif Rasmussen, at least in his recent album Dancing Raindrops (Aldubaran) (dacapo 8.226567). The musical syntax is generally abstract, dialogic yet lyrical as well. 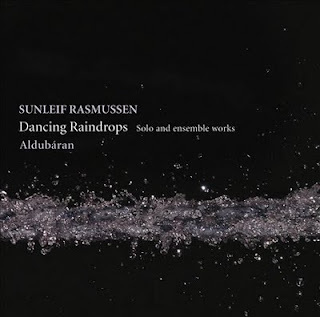 The title piece "Dancing Raindrops" suggests of course a natural landscape with clarinet, violin and piano initially engaging in deceptively random yet interdependent interactions that become increasingly dense and lively, suggesting the natural rhythms of rain falling and periodicity-order within a naturaly chaotic state. "Suite" (2007), a piece for guitar and effects processor, begins as a lively modern classical guitar piece, then enters into denser voicings that begin to be shaded by electronic alteration, until it becomes aetherial, almost harp-like. The music expands further to a kind of cosmic canopy of sound that is not unattractive. The short flute duet, "Andalag #2," again suggests natural processes, mediated by a poetic sensibility. "Like the Golden Sun" (1993), for piano and effect processor again begins with conventional acoustic soundings, this time in a pan-tonal, expressive-rhapsodic mode. There are cycles of relative agitation and repose, until a playful motif enters for piano and echo, followed by a dynamically integrated sound excursion for piano clusters and their electronic transformation. It's quite dramatic. The final movement introduces mystery with bell-like transformations of piano sounds. The program concludes with "Mozaik/Miniature" (1999) for flute, clarinet, piano and violin. Its a very evocative piece with longer lines interacting with shorter contrapuntal punctuations in piano and winds. Again the techniques of modernism are utlized to poetic ends. Sunleif Rasmussen has given us an intriguing look at his musical world on this album. It teases the listener with just enough of each sound universe to want more. As it is it is a most enchanted program that delights as it spins its various webs of delicate sound events. It will no doubt be appreciated by any enthusiast of modern chamber music and it sets expectations for longer works to come. Highly recommended. 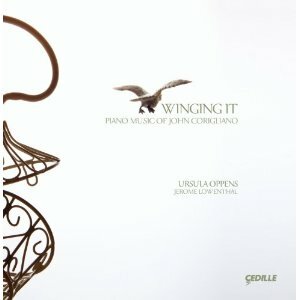 John Corigliano's Beautiful Piano Music, Stunningly Played by Ursula Oppens on "Winging It"
John Corigliano has proven to us all that orchestrally and operatically he has a keen sense for the dramatic, a sharp ear for what sounds well together and how it might be developed. He has a strong sense of the past and utilizes it to breathe life into present-day concert music. I don't suppose anyone would contest at this point that he is one of America's leading living composers. But what of his chamber music? We all know composer who have excelled with the gigantism of massed forces only to falter when simple resources are at his disposal. One or two listens to Winging It (Cedille 90000 123), a recital of his solo piano music beautifully played by Ursula Oppens, will dispel any doubts on that score. First off, Corigliano's piano pieces are written to sound well in the right hands. They all are very pianistic in conception. Second, Maestro Corigliano often engages with and channels composers/music of the past in these pieces. Either direct quotations or allusions to masters Stravinsky, Ives, Beethoven, and others are heard in many of the pieces. He transforms in each case the musical material to his own idiosyncratic ends. Third, and most importantly, the results are very personal, very original, and very challenging-rewarding to the musical ear of the listener. All five pieces on the disk are magnificent examples of the pianistic arts. They are played with dynamic verve and soaring mastery by Ms. Oppens (joined ably by Jerome Lowenthal on the two-piano works). Here we have almost an embarrassment of musical riches. But who is complaining? This is a must-have for modern chamber classical buffs. Dubbed "A New Opera for Children," Ronald Corp's The Ice Mountain (Naxos 8.572777) has much in the way of charm and a fairy-tale otherworldliness. It has some of the pastoral rusticity of Vaughn William's opera Hugh the Drover, the choir-writing expressiveness of Britten, plus some of the sensori-motor compulsion of the minimalists. 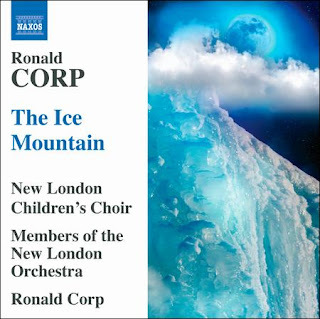 Since the only opera for children that I am familiar with is Copland's The Hurricane, I don't feel qualified to put The Ice Mountain in some kind of wider context of works of its kind. Nonetheless in its own right it captivates. The New London Children's Choir sound angelic; the New London Orchestra do a fine job; if some of the vocal soloists seem less than stellar, it is to be expected among young singers and is not a serious drawback. I found the CD a most pleasant diversion and a worthy addition to my modern English composers cache. If you are a serious Anglophile, you will as well. I should think.